eBay Description Note: 1. Do not support hot water shower; 2. The Heart Rate & Blood Pressure & Blood Oxygen Monitor Function is only given as a health status reference, not for medical use. Features: 1. Display health parameters This smart bracelet can display the time, the date, the steps, the distance, the calories and the heart rate Clear that the TFT display. Get your sports data immediately and plan your exercise scientifically 2. Synchronize sports data When paired with your smartphone via Bluetooth, it syncs your data to the phone and give you a real-time evaluation of your exercise during the day. 3. 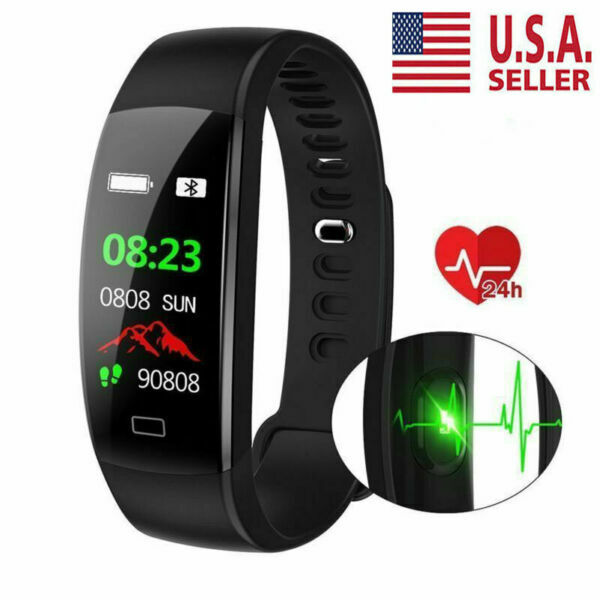 Heart rate monitor Wristband with a photoelectric heart rate monitor could monitor and reference the exercise heart rate to help you scientifically adjust the state of motion and Consuming fat continuously and efficiently. It can automatically monitor your heart rate for 24 hours, and you can also manually measure your heart rate. 4. Blood oxygen and blood pressure monitor Monitor your blood oxygen and blood pressure, learn more about your body. 5. Calls reminder Designed to avoid missing important incoming calls. Once the mobile phone is bluetooth connected, F64HR Will vibrate to show the incoming calls with phone number or name even in noisy environment. 6. SMS and Social Notice reminder If there's a notification, the Smart Bracelet vibrates to remind you with the app icon, and you can click the icon to see the content. All important incoming calls, SMS / Skype / Whatsapp will not be missed. 7. Sleep tracker Tracking and analyzing your sleep quality throughout the process, such as the time to fall asleep, the time of deep sleep, and flat sleep. You can set the sleep switch manually on the bracelet or set the sleep start time on the APP. It can also report your monthly sleep quality. 8. Remote camera You can capture every exciting moment and take the video with the smart bracelet via the remote control of your phone 9. alarm clock allarm You can set alarm clocks to remember something important, such as taking medicine, getting up, and so on. 10.Fernmusik Play music via the smart bracelet via remote control of your smartphone. 11. Sitting memory Bluetooth Heart Rate Bracelet reminds users to take timely rest to avoid fatigue. 12. IP68 waterproof IP68 internationally waterproof and dustproof grade can not only keep the grain dust corrosive materials such as cosmetics and sweat etc. In the daily. You can even wash it with water and wear it while swimming. 13. Anti-lost and find phone If you start with the phone on the wristband, the phone will ring and vibrate. (If the ringer phone is on) 14. Wake-up gesture The screen lights up when you turn your wrist. Packing list 1 x Smart Band Payment 1. We only accept PayPal, payment system supports Mastercard, Visa, Discover, American Express and eCheck. 2. Please make sure you have a valid PayPal account before bidding. 3. The payment shall be submitted within 7 days after the transaction is completed. If the payment is delayed after 7 days, we have the right to cancel the transaction and re-sell the item you ordered. What’s more, there will be UPI(Unpaid case) in your ebay account. Shipping 1. We only ship to USA. Free shipping is offered to all items. 2. Items will be shipped within 24-48 hours after payment confirmed, except weekend (Saturday and Sunday) and Chinese/USA official holidays. 3. Shipping time is different from the item location. Items located in USA will be shipped out via USPS and delivered to you within 5-7 business days. Items located in China will be shipped out via E-packet and delivered to you within 15-20 business days. 4. The items will be shipped to your paypal address unless the different mailing address is informed before or when the payment is sent. If a wrong mailing address is provided, we will not take any responsibility of it. Return Policy & Warranty 1.In our store, you will enjoy 30 days return/refund guarantee (Excluding misuse of the item and damaged item). 2.If the item you received is faulty, damaged or incorrect, or any further problems, you can return it for replacement or refund, please contact our customer service on eBay within 30 days from item received. 3.For damaged items on arrival, please contact us immediately, sending us an email with a photo is preferred. We will offer solutions to such cases. Full refund or replacement will be guaranteed.